So, I didn’t get a post out last week and I apologize. It’s not that my house was perfectly clean and I didn’t have anything to show you, it was that my house was a disaster zone that I didn’t have time to properly clean. That’s the story I’m going with, although if you follow me on Facebook, you’ll know it’s true. Anyhoo, I have this theory that hot water and soap can clean just about anything and it’s working out pretty well so far. I decided that I would try it out on the bathtub and see if it could get rid of the inevitable soap scum build up. The vinegar and dish soap trick worked pretty well, why won’t this one? Oh, wait, it does work! But with less suds and vinegary smell. Here’s how to remove soap scum with hot water and dish soap. Let’s take a look at what we’re dealing with first. I actually did let my tub get this bad so I could take good before and after pictures, so don’t judge me, I really do hate having a dirty bathtub. It’s gross. I know, amazing shot in a room with no windows. Step One: Add a small squirt of dish soap and fill the tub up with hot water just past the soap scum line. Step Two: Let it soak! Close the door and let it soak for 30 minutes to 1 hour. I was cleaning the rest of my house while I was waiting. Step Three: Drain tub until there’s about an inch or two of water left and add more dish soap then scrub! The soaking should have softened up the scum so this should be light scrubbing. Step Four: Rinse and you’re done! Tada, sparkly clean tub with no more soap scum. 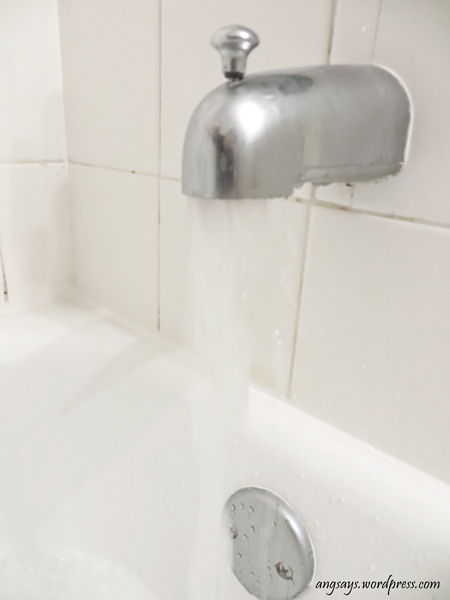 While cleaning the soap scum from the tub, I realized that the very soapy water at the end is important because soap scum does not like to come off all by itself. Duh. That and the dish soap eats through the body oils and dirt making it easy to scrub off the remaining nasties. 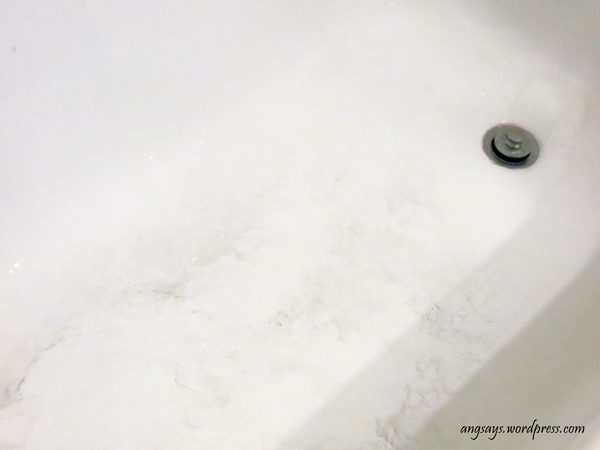 I loved this solution because I didn’t have to go out and buy a specific chemical for the tub and this method is safe for any tub type. If you have a stand up shower, I’d recommend cleaning it right after you’ve showered because all of the steam should have soften up the soap scum. Then have a bowl of hot water and soap you can dip your scrubby into. 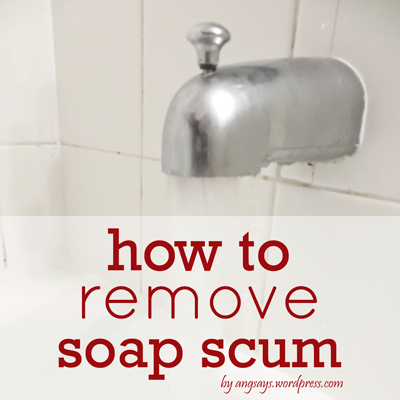 What are your best tips to remove soap scum? Neat tip! I’m still looking for a good way to get the scum off my shower surround, obviously it bothers me more than the previous owners! Good luck! If you have hard water stains on your surround, vinegar will take it right off as soap won’t do too much. Sometimes soap scum is a mixture of hard water build up and the usual nasties. I have one word for pretty much any cleaning situation: Dawn. I just used it to clean Venetian blinds and they look fantastic…and I did not scrub at all, I just soaked them in extremely hot water, with Dawn until the water got cool enough for me to swish my hands around (about an hour), then I drained the tub and rinsed them with the shower head. Voila…and the tub looked pretty good, but I never made an association! I have eleven more blinds to do, AND the bonus will be a clean tub! 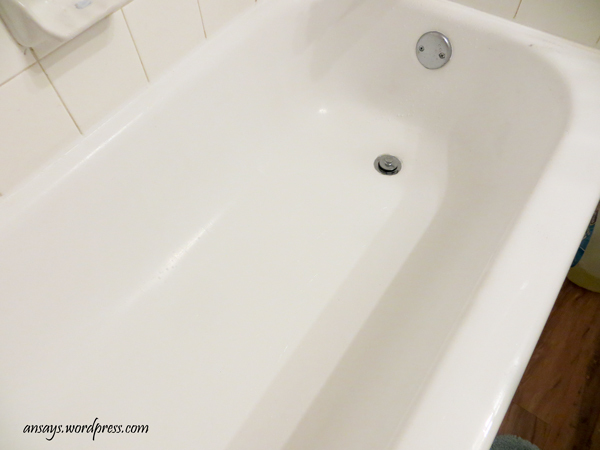 God, I hate to clean the tub, but I REALLY hate a dirty tub…so for a while at least, all my problems will be solved! Amen to that!Besides vinegar, it’s my go to cleaning solution. Yesterday I spent quite a while browsing your terrific blog! I saw a response from someone (a guy I think) who wrote about a test that was done for liquid dishwashing detergents. He said that some product got and A and Dawn got a C…well, now I can’t find the letter and I can’t remember the product…it was “Planet… something”, I THINK. Do you know what he was talking about? Because, wow, would I like to try that! Dawn is great, but if there is something that works BETTER? And is good for the Planet? Sign me up. I’m sure you don’t have time to spend hours browsing through your mail, but I was kind of hoping you had indexed it somewhere. Any help would be gratefully appreciated. I LOVE your site!!! Love it! I actually remember what you’re talking about and Dawn did do poorly. The site is http://www.ewg.org/guides/cleaners and there you can find out how safe your cleaning product is for the environment. For soaps, castile soap ranks as very safe (Dr. Bronners is a favorite brand). I’ve browsed this site quite a few times and find it very informative; makes me want to be nicer to the environment. Thanks so much for visiting the site and I don’t mind at all you spending hours on the blog. It makes me so happy that you love the information you find here. I may have to try this tonight. I’ve tried the vinegar and dawn trick and it definitely worked, but the vinegar smell was extremely strong. This is definitely a better option. I agree with you on this one. 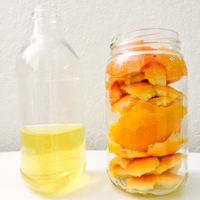 I clean with vinegar frequently but don’t love the smell. I’ve had good success with baking soda. 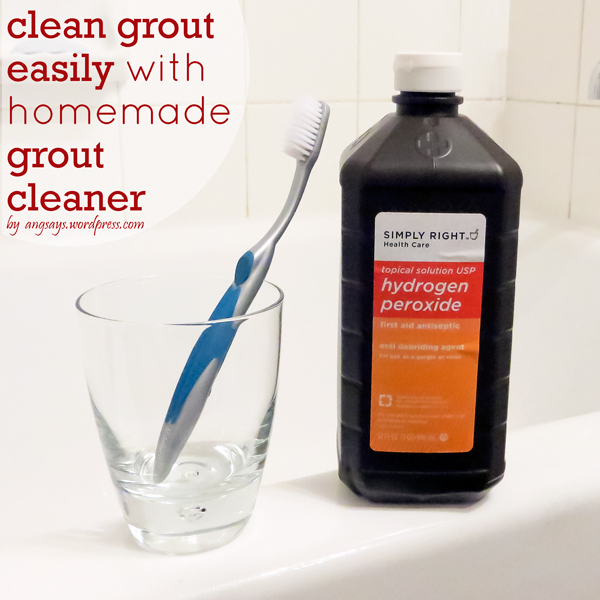 I think I’d like to try this method, though, to see if it makes the scrubbing process easier. Our one tub/shower gets a lot of traffic and gets nasty. Anything helps! For me, it was very light scrubbing after soaking it and using very soapy water. Good luck! Yes, I agree with you. What also helps is to use liquid body wash or a bar soap like Dove which doesn’t leave a heavy build up. Now I would like to know how to get permanent marker off of tupperware ? Someone told me alcohol…..doesn’t work…..I put some on and rubbed and rubbed and even let set overnite and then rubbed again, it is still on there…….would anyone know how to remove this ? I’ll get back to you on that. I don’t know off the top of my head.